Developed from actual competition, TEIN was able to create a fully adjustable damper that can be easily tuned for any track and weather conditions. Super Racing Dampers utilize a full-length adjustment system to allow shock length and spring pre-load to be adjusted independently. Separate 16 - way adjustments for compression and rebound damping enable the user to fine tune for any situation. TEIN has incorporated both camber and caster adjustment into the front pillow ball upper mounts for strut type vehicles. External reservoirs on SA type dampers allow for added oil capacity. Designed and tested for circuit use by advanced and professional drivers who are seeking complete damper tuning capability. A: Yes we do offer just the rear camber plates that come on these kits. Please contact our customer service representatives for a price quote. Please keep in mind these top hats are specific to these Coilovers, so we are not able to support cross fitment on other brand or models of coilovers. Will a set of springs need to be purchased along with this kit? 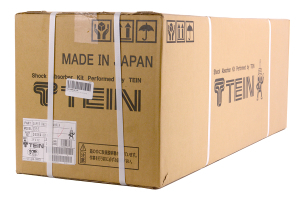 A: These will require custom racing springs from Tein to be ordered to your specifications.